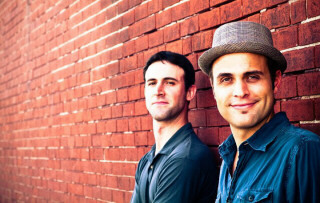 The Michaels is a creative partnership of Brett Wiscons and Jon Shoulders, two veterans of the Indianapolis and Bloomington live music scenes. Brett co-founded Great Scott!, one of Indy's premier rock acts, around the same time Jon began his performing career by winning first prize honors at an annual Battle of the Bands event held at Uncle Fester's House of Blooze in Bloomington. The two performed consistently with their respective acts throughout Indiana and neighboring states, eventually teaming up when Jon joined Great Scott!. Shortly after, they decided to explore the possibility of an acoustic act, and The Michaels was born a few months later. Combining percussive guitar work and smooth, soaring vocals, The Michaels gives fresh meaning to what an "acoustic act" is suposed to be. 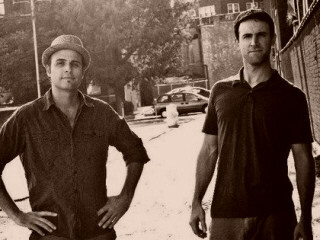 The duo teamed up with percussionist Daniel Wyrick in early 2009, and continue to play occasional trio shows as well. With an ever expanding and changing play list, the band tailors its show to the given audience, with the experience and depth to handle any style and era.